For the first time full authoritative texts of Darwin's are made available, edited according to modern textual editorial principles and practice. 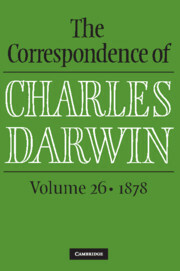 Letter-writing was of crucial importance to Darwin's work, not only because his poor health isolated him from direct personal communication with his scientific colleagues but also because the nature of his investigations required communication with naturalists in many fields and in all quarters of the globe. Thus the letters are a mine of information about the work in progress of a creative genius who produced an intellectual revolution.